What would you do for a lifetime pass to a place where every morning is Christmas and unhappiness is against the law? Don’t give up on wonder! Don’t give up on dreams! We’re looking for go-getters who love children and aren’t afraid of adventure! That is an excerpt from my review of NOS4A2 , for Haunt of Horrors Press. As you can probably tell by reading the above passage I am absolutely in love with this book. Hill has accomplished something special with this novel which officially places him in the running with the rest of the worlds best horror writers. Though most already know that he is an offspring of the King himself, he has done a damn good job of writing under his pseudonym, earning his way with the absence of his family name. These inscapes are an excellent adaptation to the use of the portal tool. Hill has begun to create and expand a new universe that I wish I could join. Whether it be ‘The Treehouse of the Mind,” the Crooked Alley, a sack of scrabble tiles, or a bike, these “knives,” as Maggie calls them, are used to poke a hole in reality allowing the user to manipulate or alter it to there choosing. This opens up so many opportunities for Hill’s characters, and increases anticipation and cravings to see him continue to play around in this realm of thought. This is a novel that every reader, casual or avid, horror fan or not, should have on their book shelf! If you have checked out NOS4A2 , let me know what you think by leaving a comment. And if you like all the tasty bits we gibber about here, become a follower or submit to receive email updates with every new post! Check us out on Twitter @UnspkbleGibberr and on Facebook at http://www.facebook.com/UnspeakableGibberer. You should not have touched this book with your bare hands. The drug is called soy sauce, and it gives users a window into another dimension. John and I never had the chance to say no. That is an excerpt from my review of John Dies at the End , for Haunt of Horrors Press. This is a great book with lots of fun crazy stuff going on inside. If you are a fiend for the weird, then this is a novel you should have in your happy little hands. 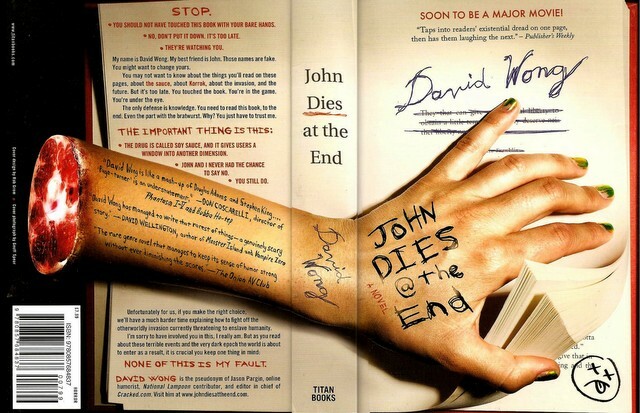 If you have checked out John Dies at the End , let me know what you think by leaving a comment. And if you like all the tasty bits we gibber about here, become a follower or submit to receive email updates with every new post! Check us out on Twitter @UnspkbleGibberr and on Facebook at http://www.facebook.com/UnspeakableGibberer.